What with the Premier League starting this Saturday, there’s so much buzz and excitement around the upcoming football. Who’s going to be the best player? What’s going to be the best team? Who’s going to score the most goals? Here at Children in Crossfire, we’re getting excited too, but we’re excited about a different type of goal – a global goal. The Sustainable Development Goals (SDGs), or Global Goals as they are otherwise referred to, are a set of 17 goals set up by the 193 members of the United Nations which act as a framework by which all countries will follow when framing their development agendas over the next 15 years. The SDGs act as a follow up to, and expansion on, the previous 8 Millennium Development Goals (MDGs) which reached their completion date in 2015. Focusing on a broader and more in depth range of issues, the Sustainable Development Goals act as a wider-ranging and more universal approach to achieve a world without poverty. The world that we live in is a much-divided place. 20% of the world’s wealthiest people own up to 80% of the world’s wealth, and nearly half the world’s population today live on less than $2.50 a day. 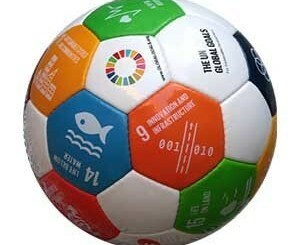 The Sustainable Development Goals were set up as a means to tackle these issues. Focusing on a wide range of topics such as Quality Education, Climate Action, Life Below Water and Zero Hunger, the SDGs were set up with one main goal in sight – to create a world free from extreme poverty. There are so many ways in which you can get yourself involved in the SDGs. Whether it’s something small like posting a tweet surrounding the #SDGs or sharing an article on Facebook, to something bigger such as hosting your own SDG themed event, there are loads of opportunities for all of us to help make a positive change in the world. In between cheering on your favourite team this weekend have a read of our blog on 5 simple ways in which you can get involved in sustainable development to give yourself a few ideas. If you ever want to get involved with our work here at Children in Crossfire, never hesitate to call into the office and see us, or you can always get in touch via phone on 02871269898 or by email on info@childrenincrossfire.org – it’s always great to hear from you!